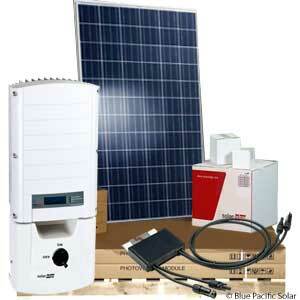 Blue Pacific Solar has provided all of the main parts you will need for your 6000W 300 Watt Panel Kit. Here are some additional items that your may need prior to installing your package. Conduit, appropriately sized electrical wire from the array, some fasteners and grounding rod and wire. Building and installing your own home solar system is not only the smart choice for controlling your expenses, it may be on the most satisfying DIY projects you ever have undertaken. Solaredge 6000W 300 Watt Panel Kit sync with the grid at 240 VAC, and because the MPPT and voltage management is handled by the power optimizer, have built-in AC and DC Disconnects, weigh just 52 pounds, and are 97% efficient. The system also offers optional wireless inverter connectivity for simpler installation, free of Ethernet or RS485 cabling. ETL Listed to UL 1742 for the US and Canada. SolarEdge has a 25-year warranty for the power optimizer and 12-year warranty for the inverter, extendable to 25 years. Current residential solar systems are typically built from ten to 50 solar panels connected in a series-parallel connection. Several panels (typically 10 to 15) are connected in series, forming a string, to achieve a voltage high enough to enable efficient DC/AC inversion usually between 150V to 600V. More power can be added to the system by adding multiple strings in parallel. This Solaredge 6000W 300 Watt Panel Kit is an affordable expandable do-it-yourself (DIY) high quality solution for your home or businesses energy independence.